I’d like to remind you brothers of the exclusivity of Christ, lest any of our number compromise to spare the emotions of a loved one, or to be accepted by men. We bring a good message, that is only good to those who are being saved. To the unrepentant, hard hearted man, who is not counted among the elect, the good news is offensive. Not only will he refuse to admit he is a sinner, he will insist he is good. He most certainly will not admit that there is only one way to God. If the reprobate confess to believe in a god, they will require it of you to approve, and celebrate many ways to the god they’ve imagined. If you don’t, you will be called all sorts of hateful names. You will be called, intolerant, bigoted, hateful, and you shall count it as joy. You will be told to stop, or lose your job. You will be told to stop, or lose your property. You will be told to stop, or lose your family. Ultimately, you will be told to stop, or lose your life. What are our lives for I ask you, if not to glorify God in the propagation of His gospel message? If we falter, and we will, we must repent, and begin again the work that He has for us. Remember Peter! He denied our Lord, his Lord, and Christ Jesus did not discard him, but used him greatly. Peter, ultimately was martyred. He was to be crucified. He asked to be crucified upside down, as he was not worthy of the cross of Christ, a cross that says of the man who hangs on it, “CURSED IS EVERYONE WHO HANGS ON A TREE ” Christ redeemed us from the curse of the Law, having become a curse for us. 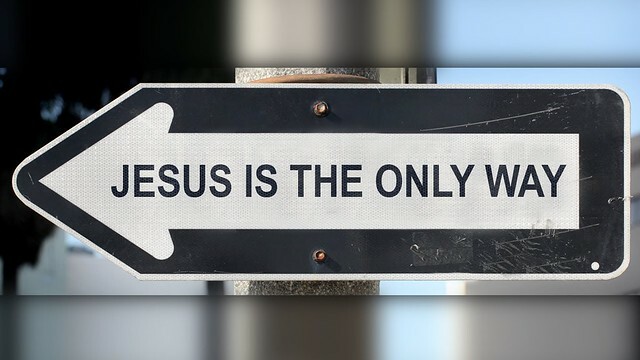 Jesus said to him, “I am the way, and the truth, and the life; no one comes to the Father but through Me.” Do we take our King to mean something other than what He has said? Do we reduce the sovereign Kings oration as simply the ramblings of a crazed man? Certainly not! I exhort you brothers, be bold for the exclusivity of Christ Jesus, our Prophet, Priest, and King!